Clyde spotted this little fella in the back yard when we went back there to cut the lawn. 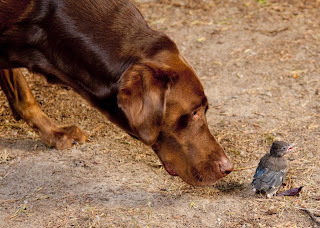 He was very curious as to what the thing was, but he didn't touch it or get rambunctious. 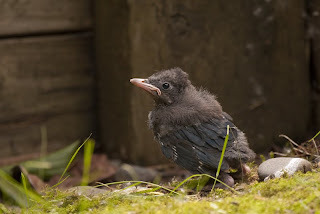 It is a fledgling Steller Jay. Mom and dad were not very happy with Clyde and I checking out their baby. One stayed close to it and made just a minor racket while the other was raising holy hell as only Jay Steller can. he was jumping from branch to branch, pecking at them, and squawking very loud. 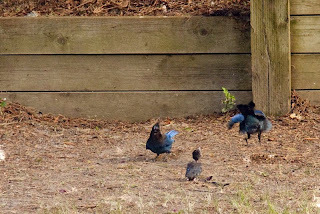 Here is a the only shot I got of mom, dad, and junior. As you can tell, they wern't staying still. Last I saw the little guy he was on the ground under the trees. I'm not going to interfere with it, I'll just keep the beast away. It was like Mutual of Omaha's Wild Kingdom back there today!